This past weekend I also discovered two friends have fantastic rooftops! Why they haven't shared til now? I don't know. Monday night we had dinner on one friend's roof and it was spectacular. Table furniture, lighting....and oh my...a breeze! Hard to believe with the weather on the streets feeling like a sauna. 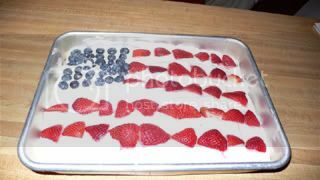 Oh and one thing I did make sure to do on the 4th is continue on my family tradition for American holidays. When I was younger, I used to get so excited for a national holiday because it meant we took the flag out and hung it outside. Now, one could just take it out and call it a day. But what fun is that? My dad and I would march around the driveway singing "It's a Grand Ole' Flag" before hanging it up. Now that I'm up in NY, I still make sure to make that call to PA and immediately break into song. It's just one of those things:) As much as I may get angry with some of the things that go on with this country, it's all because I care so much. Seeing the flag is something that makes me remember that yeah it is a great country....and I'll do my part to keep it that way. And that's it for now...just got back from speed on the East River (yay for running in my backyard!). Though I couldn’t do it this year, I often spend Independence Day in Upstate NY with friends who save their Christmas tree until the 4th of July so it gets all dried out. They then toss the old Christmas tree into a bonfire and sing “I’m a Yankee Doodle Dandy” with sparklers. Odd? Yes. Patriotic? You bet!